Buying a new pram, pushchair or buggy can be an intimidating experience. Aside from your budget, which will for the most part dictate what you can buy, there are lots of things to consider before making a purchase. Your general lifestyle, where you live (town or country), whether you will be commuting with baby, and how many babies you’ll be pushing around at once will feature heavily in your decision making. As well whether any other regular caregivers who may also require access to the pram, pushchair or buggy. Before we run through the main things to keep in mind before buying a new pram, pushchair or buggy, let’s talk about safety. All prams and pushchairs must now have a safety label that shows they comply with the British Standards of safety requirements and test methods necessary for ‘wheeled child conveyances’. The numbers you should be looking out for are BS EN 1888: 2012 or BS EN 1888: 2003. Most reliable brands have this label attached to their prams, pushchairs and buggies anyway, but it’s always worth double-checking. What’s the difference between a pram, a pushchair and a buggy? When you get technical, there are differences between a pram, a pushchair and a buggy. A pram is usually parent-facing and designed exclusively for newborns and younger babes up to around six months old. They're similar to the baby carriages of old, but have way better suspension (so as not to wake a sleeping newborn) and many modern features to keep baby warm, dry and happy. A pushchair is suitable for older babies and toddlers. Unlike prams, pushchairs tend to be forward-facing (away from you), giving baby an exciting view of the world unfolding before them. Buggies are lightweight, simple to collapse and easily thrown into the boot of a car. They are often cheaper than prams and pushchairs, with some parents buying them to give younger children the option of having a sit and a rest if they get tired on longer walks. We don’t like to be party poopers but, before you begin shopping, take a few minutes to work out your budget – the absolute most you have to spend on a new pram, pushchair or buggy, plus the ideal amount you would like to spend. Staying within those parameters helps you avoid breaking your bank. How much budget you set depends entirely on your financial circumstances, and don’t think that less money equals a sub-par pram, pushchair or buggy. There are some cracking sub-£300 buys to be found, but you may have to sacrifice some of the extra frills you’d find on more expensive models. The Baby Jogger City Lite Stroller is a real steal, for example, as is the Mothercare Journey Travel System (UK) and the Cynebaby Newborn Baby Stroller (US). Travel systems are more expensive than a stand-alone pram, pushchair or stroller, but they will ‘grow’ with your baby so, long-term, you’ll get more use out of them. Take a look at the i-Safe Grey Trio Travel System Pram and Luxury Stroller if you’re based in the UK, or the Graco Aire3 Click Connect Travel System Gotham if you’re in America. Are you buying a pram, pushchair or travel system for a newborn, or a newborn plus an older sibling? Health experts say that newborn babies should lie flat in a pram to assist with breathing and to protect their backs. The majority of prams are geared up for newborns to lie in this flat position, and many pushchairs have a 180-degree recline position that’s also suitable. Newborns and young babies, between the ages of three and six month, will be fine on their backs if not cuddled up with you in a snuggly baby carrier. Older babes and toddlers can sit more upright in pushchairs and buggies, enjoying the view as they’re pushed around. When they’re tired and ready for a nap, simply recline their seat. So make sure that any model you’re thinking of buying has reclining options relevant to your child’s age. 3) How many children will be using it at once? If you have one child you can choose whichever single occupancy pram, pushchair or buggy you like – lucky you! Add in two babies or more and your options become a tad more limited. Not massively, though, as manufacturers are bringing out more and more pushchairs and buggies made for twins, or for a younger babe and an older sibling to share. Look for the words ‘duo’ or ‘tandem’ when searching for pushchairs or buggies for two children, and make sure they have easy-folding mechanisms. After all, the last thing you want is to be wrestling two little ones and an unruly pushchair. If you have twins plus an older child, look for a duo or tandem pushchair or buggy that has a built-in standing platform for your older child to grab a ride when they’re tired. It will also help them to feel more included when you're pushing along their younger siblings. The Graco Stadium Duo Double Pushchair is a hugely popular pushchair for twins, or for a baby and older sibling. As its name suggests, this pushchair has stadium style seating so that both children can see out better. The Stadium Duo also has a four-position recline for the rear seat, perfect for your younger baby’s nap time, and a two-position recline for your older one riding up front. 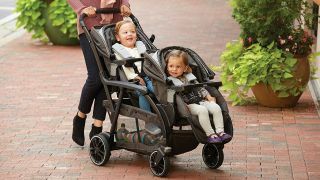 In America you can purchase the similar Graco Ready2Grow Click Connect Stroller, designed with two riding options and a standing platform for older siblings to hitch a ride. 4) Where and how will you mostly be using it? City parents may not be so bothered about an all-terrain pram, pushchair or buggy compared to parents who live in or near the countryside where off-road walking is a way of life. That said, if you intend on taking baby on regular nature walks in parks, or around the grounds of beautiful National Trust properties, you might want to consider a model that does have all-terrain or off-road features. The Mountain Buggy Swift is worth a look. Will you be jogging with baby? If so, choose a pushchair or buggy built especially for parents who like to jog, as well as walk, when taking their little ones out for some fresh air. There are plenty of jogging buggies around. For inspiration, explore the Baby Jogger City Mini or the premium yet highly rated Bugaboo Runner Stroller. Your working lifestyle may also play into what features you should prioritise when choosing a pushchair or buggy. For example, when you return to work will you be commuting with baby? Any pushchair or buggy that has a super-fast fold-down mechanism, and that folds up neatly, will serve you well during rush hour and on crowded public transport. Try the nifty Maclaren Quest Sport. 5) Will other caregivers be using the pram, pushchair or buggy? As with buying a new car seat, if other caregivers will be regularly using the pram, pushchair or buggy you’re thinking of buying, keep in mind their level of mobility and practicality. If your parents will be regularly looking after baby while you’re at work, for example, you may want to send them a few links to your favourite prams, pushchairs or buggies before purchasing to get their opinion on which one they would find the easiest to push around. The GB Pockit+ Stroller, for example, has a simple folding mechanism that's suitable for many people to use. The Graco CitiSport Lite Pushchair Sport Luxe is another easy to 'drive' option. The final purchasing decision lies with you, of course, as you will be using the pram, pushchair or buggy the most. Also, check to see if the manufacturer has an online user’s guide that your family or friends can view if needed. 6) How easy is it to care for? Delicate fabrics are not baby proof! Prams, pushchairs and buggies are made to be used. Their wheels will become encrusted with mud, leaves and debris. The insides will become a moveable feast of crumbs, spilt milk and other baby snacks. Prepare yourself for the inevitable by choosing a pram, pushchair or buggy that’s easy to clean. Do this by looking at the types of material used inside the pram or pushchair as well as outside. The wheels and frame (be careful with some rust-prone metals) are easy enough to clean by hand or with a pressure washer, but what about the seat, the hood and any inner lining? Can you take a wet wipe or a soapy cloth to them? Better yet, can any parts be removed for a machine wash? If you can answer yes to these before purchasing, you'll thank yourself later. 7) Does it have decent storage? Surprisingly, this is an often overlooked consideration when it comes to buying a pram or pushchair, but onboard storage for a baby changing bag, your bag, plus coats and other belongings is very important. Especially if you intend on taking baby out on day trips or shopping with you – the undercarriage of a pram or pushchair, for example, can be prime real estate for stashing bags.